The twelfth edition of the International Award Architecture in Stone is an event that is open to new horizons in lithic language. The Award is the culminating moment of research that Marmomacc, every two years, performs in the vast panorama of world architectural production. The Award, ever since it was created in 1987, has been a fundamental guide in the world of architecture and design that searches for new directions and experiences in use of lithic materials, marrying professional expertise with innovation. The 2011 Edition of the Award, curated, like the preceding editions, by Vincenzo Pavan, has availed itself of a prestigious international jury of historians, critics and professors of architecture. They have substantially contributed to the quality of the Award and simultaneously ensured a selection that is pluralistic and rigorous. The selected works, in fact, range from important public buildings regarding large European institutions to works that recuperate degraded urban zones, exposing the quality of pre-existing stone structures integrated with similar lithotypes and combined with other materials in harmony with them. Other selections illustrate cultural and religious works that put stone in relation with Nature and with local history and culture, evidencing the outstanding ability of lithic materials to interpret, in our times, evocative and spiritual principles. This edition, like recent editions of the Award, also includes works built in difficult territorial conditions and that are able to bring together ethics and aesthetics through coherent use of local materials. And, finally, there are two significant special awards that, while they do not refer to contemporary works, they are closely connected to them. The “ad memoriam” award this year has been given to the works of a recently rediscovered Greek architect: Aris Konstantinidis. Here we have a small building representative of a series of his works where stone is structurally conjugated in an exemplary marriage of modernity and tradition. The “vernacular architecture” award highlights an extraordinary episode of architecture “without architects”: the Svaneti tower-houses on the Georgian slopes of the Caucasus mountains: a precious historic example of stone building and typological traditions that are about to be confronted with the new that advances. The form of the Award consists of publication of a prestigious volume containing ample documentation of the award-winning works and many critical and historical essays by eminent members of the international architectural community. During the 46th edition of Marmomacc, the International Award Architecture in Stone will be at the center of cultural events scheduled for “Marmomacc Architecture Design” and will be formulated in two events: an Exhibition of award-winning works and an Official Ceremony presenting the winners. September 21th-24th: The award-winning projects will be displayed in an exhibition involving drawings and photos open during the Exhibition itself in Veronafiere. A prestigious book in two languages (Italian/English) will also be published to illustrate these projects in terms of language, aesthetic-architectural quality and materials technology. Saturday September, 24th 2011: The Award Ceremony will be held in Verona, Castelvecchio Museum when the winning architects will illustrate their theories and experience in the use of stone in architecture. The building groups all the libraries of the Humboldt Universität of Berlin, previously disseminated throughout the city, into a single building. It inserts a large compact lithic volume, with extraordinary transparency and openness, into the urban fabric. This is a result of a search for rhythms and proportions in the facades which, at the various levels of the building, include sequences of vertical openings formed of a dense network of vertical modules, giving controlled dynamics to the monolithic body of the building. 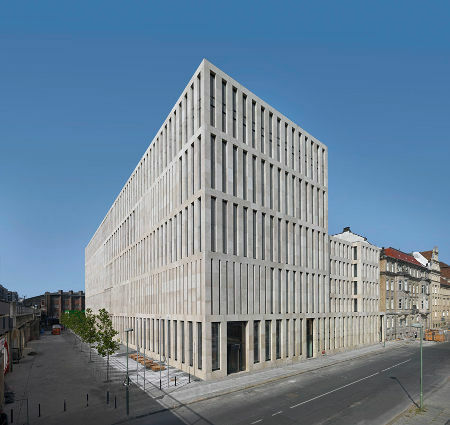 The Spessart limestone that covers the facades, roughened by high pressure water sprays, substantially contributes to the concept of solidity that the building strives to communicate. The Jacob-und-Wilhelm-Grimm-Zentrum was created as central library and media collection for the Humboldt Universität in Berlin. It can simultaneously contain 750 students, offering two and a half million volumes and 500 computer stations. The clarity of the layout and the organization of pathways immediately orient visitors who feel free to move on both horizontal and vertical planes. A large double-height atrium acts as a filter between interior and exterior, a modern stoà that functions as a forum for discussions and interrelationships. The public, from this area, accesses reading rooms and individual study spaces, areas that are in any case permeable to sight and constantly dialoguing with the city. The concept of library is reinvented without, however, overlooking references to the traditions and materials of ancient libraries such as the use of stone in the trilithic form of the façade structure and of wood in reading hall flooring and wall coverings. The project, built near the historic center of Santiago de Compostela, enacts a program for urban residential requalification on pre-existing constructions, recuperating the remains of an ancient building in ruins. López Cotelo, escaping from the self-referencing nature of several recent architectural works built in the capital of Galicia, adopts a measured and respectful stance towards the existing context, intervening with lightweight structures on the massive granite walls. 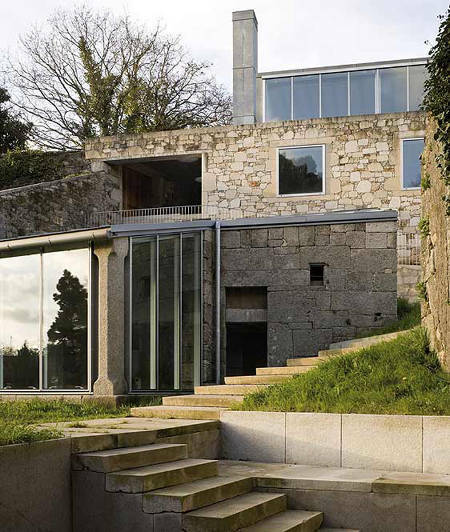 The project, through a series of measured stone walks that connect the various land levels together and thanks to discreet completions of masonry in local granite, re-connects the old and new buildings to the urban context. The López Cotelo office has carried out attentive upgrading of a complex of historic structures existing in Santiago de Compostela, completing these with new constructions. The work recuperates an ancient abandoned tannery and the context where it was located, respecting and interpreting, with a modern language, the typical elements of industrial buildings and the Galician countryside. The buildings of the old factory are grouped together in two nearby complexes: the factory, with its grid of stone pillars, near the river; the mill and the miller’s house, on higher terrain. The intervention, extremely respectful, aimed at recuperating the specific character proper of the industrial architecture. The architect, in the block of newly built apartments, used recuperated stone in the base surmounted by a lightweight body made of glass and closed with a galvanized roof. External stone paving underlines the “rural” character of the intervention and connects existing and new in a unicum of high formal excellence. 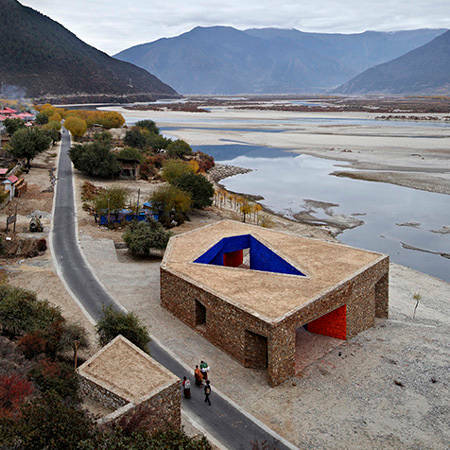 Three works support a path which, along the Yaluntzangpu, connects the river with several villages in the Tibetan region of Linzhi, bringing into relationship the demands of the “architectural” credo of the Standardarchitecture studio with the local native lithic culture. The two Visitors Centres and the River Terminal interpret and revitalize traditional stone architecture without bowing to the picturesque. On the contrary they elaborate in a new way certain applications take from local culture such as the highly colored pigments obtained with natural powders and applied directly to the surfaces of the stone. The clean lines and measured structural logic are at the roots of solid and sustainable architecture integrated with the environment. Common characteristics of the three structures built in Tibet by the office of young Chinese architects are the complete integration in the surrounding landscape, the use of local materials and stone collected in the vicinity, the use of traditional techniques by Tibetan craftsmen. The embarcadero, located on the most remote stop on the Yaluntzangpu river, is characterized by a series of ramps that rise up from the water. The structure, fairly Spartan, gives basic services, ticket office and bathrooms and an eventual nighttime shelter for local travelers and tourists who are not able to leave because of bad weather. The Namchabawa Visitors Centre rises up on a slope along the same river, at the foot of a mountain that is 7782 meters tall. The 1500 square meter building appears as an archaic vision with a series of walls anchored to the slope and almost lacking in openings. This is an information center and support structure for tourists and also a get-together point for the local population. The Niyang River Visitors Centre is a minimal structure with simple volumes marked by deep openings where sunlight penetrates from different angles and creates constantly changing perceptions. Color transitions highlight the geometric transitions incumbent in the space. Two small volumes with simple geometric shapes, set in an extraordinary natural habitat, establish the study and observation sites for the Laguna Furnas Park, a volcanic crater covered with luxurious vegetation. Local basalt, used in homogenous parallel patterns in the external covering, rising from perimeter walls up onto the roof, accentuates the light distortions of the volume and make their form ambiguous. A work where extreme design precision in every minute detail is indispensible in achieving the mysterious power communicated by these buildings. 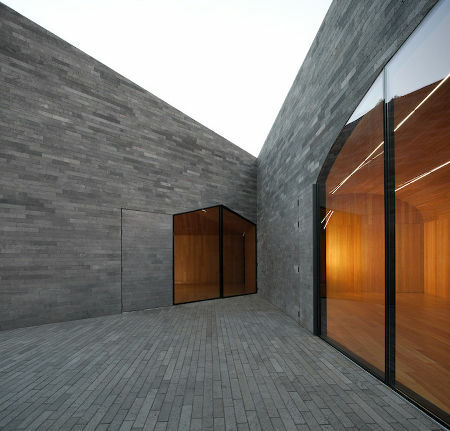 The Research Center is characterized by the presence of an intermediate space between interior and exterior, a patio created by a subtraction of volume, conceived almost as a sculpture, a block of material excavated so that light may enter. The inner facades and the distribution system of the building take place inside the patio. The building for temporary lodgings is compact, symmetrically divided into four units with accesses from four sides derived from the orientation of the sun’s rays. The monolithic appearance of the building is achieved using basalt applied on a continuous shell of concrete. A totally wood interior corresponds to the totally stone exterior. The Jury, continuing in the directions initiated in the preceding edition of the Award, has chosen to award a minimal work, far away from spotlights and exhibitionism, but with a profound sense of spirituality and generosity (Shramdaan). 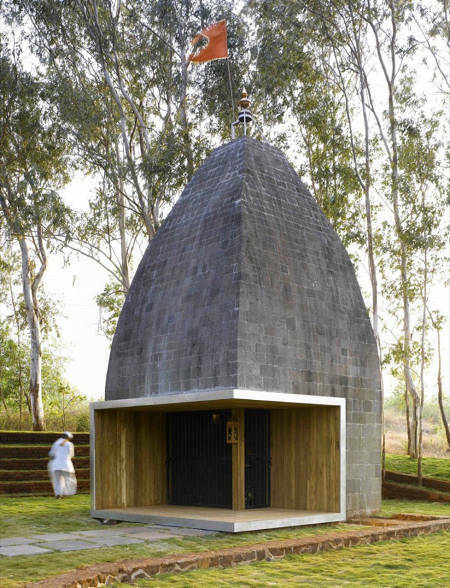 The project, in fact, was a gift to the Hindu community by the architect Padora; workers donated their labors even beyond normal work hours; a quarry furnished the stone for a construction that offers the people a place of cult perfectly inserted and integrated in the landscape, where “trees are the backdrop and the sky is the roof”. A work that conjugates, in an exemplary way, a sophisticated process of intellectual simplification with the crafting talents and the resources of the territory. The temple rises in a spectacular landscape, on a tree-lined hill overlooking Lake Andhra, from which it radiates a sense of sacred isolation. The Temple of Shiva, when the project is first examined, may seem a temple of ancient origins, fallen into ruin, rediscovered and reclaimed for the uses of the present Hindu community. The basalt tower, the shikhara, harks back to traditional construction concepts for sacred buildings and keeps all the symbolic elements, bare and stripped of decorations and embellishments in order to save on materials and labor. The only concession to modernity is the steel-covered oakwood portico with a lowered height that invites visitors to bow down as they pass in front of the divinity. Light penetrates from above through a oculus in the heart of the dark garbhagriha (the sancta sanctorum). The Kalash, made of ashtadhatu, an amalgam of eight different metals (gold, silver, copper, zinc, lead, tin, iron and mercury) is on the top of the roof, making the site a sacred place for Hindus. The basalt, often used in local constructions, comes from a quarry located about 60 kilometers from the site and was laid by local masons and stone-cutters. The architecture of Aris Konstantinidi, positioned in a delicate equilibrium between Greek rationalism of the nineteen thirties and forties and the vernacular modernism of Pikionis, belongs to that area of architectural thought that uncovers the reason for the formal result of the work in the logic of its construction process. In this way it is never folkloristic and the use of local stone in his Mediterranean houses, like those of Anávyssos,i Spétses and Egina, does not recall the form of rural constructions but rather uses the construction wisdom that produced them, entrusting composition of spaces and rhythms to a philosophy near that of Mies van der Rohe. Konstantinidis gives us a lesson on tectonics that forces us to reflect on the richness and complexity of simple forms. Konstantinidis builds his stone houses only when they are inserted in a natural context, where the ground is rock, where there are nearby quarries and where man has already marked the territory with anthropic elements (paths, walls, folds for sheep) in barely roughed out blocks or drywall stone. Stone is used by Konstantinidis as it has been used for millennia by builders, farmers and shepherds, exploiting the functional and size characteristics of the material as well as its inexpensiveness and the possibility for reuse. 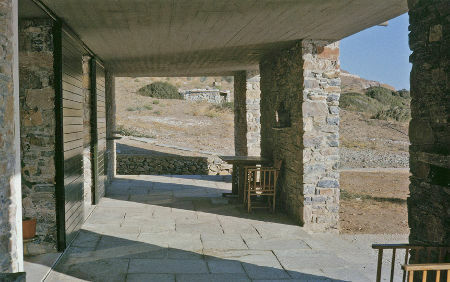 To design a house he refers to the criteria of proportions and satisfaction of functions that were followed and respected from immemorial times by the anonymous builders who made the landscape of Greece unique and special. His stone houses seem to grow up from the ground like a plant, marvelously integrating themselves in the surrounding landscape. 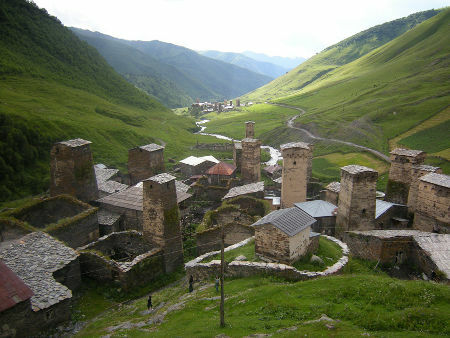 The groups of tower houses that characterize the settlements of Upper Svaneti, inserted in the extraordinary mountain landscape of the Caucasus, are a unique example of vernacular architecture in stone. Their dual functions, as residences and for defense, has ancient origins but it is at the start of the 12th century, at the time of the Mongol invasion, that this type of building becomes common in communities of the Inguri Valley. The antiquity of the buildings and their superb landscape quality were the reason for their inclusion in the Unesco World Heritage List. The Award intends to investigate and examine the originality of this residential and construction system in relationship to its site. Svaneti, a region known in antiquity as Colchis, famous for the legend of the Golden Fleece and mentioned by Strabo in the 1st century, A.D., is located on the slopes of the high mountain range of the Great Caucasus. The region, difficult to access, was spared invasions thanks to its isolation, permitting it to preserve extraordinary medieval villages (Mestia, Ushguli and Latali) with their typical tower houses built between the 9th and the 12th centuries. The characteristic of svanme houses is their tower, with a square footprint (5×5 m) and a truncated pyramid shape, about 25 meters high and generally containing 4 stories of which only the last has narrow slits for windows. Generally the traditional residence of a svana family (called Machubi) is a large two story construction with the ground floor used as a stables and the first floor as the hayloft and as the residential zone. Generally the tower is attached to the house. Svane family groups could count up to one hundred members.